The Elite. It is light, with incredible performance supported by a dedicated graphics card, but will it still have a good battery life? Could this slim 13.1” laptop with its docking station, mat 1600x900 display, DVD player and HSPA module fulfill its ambition to become the perfect business all-rounder? 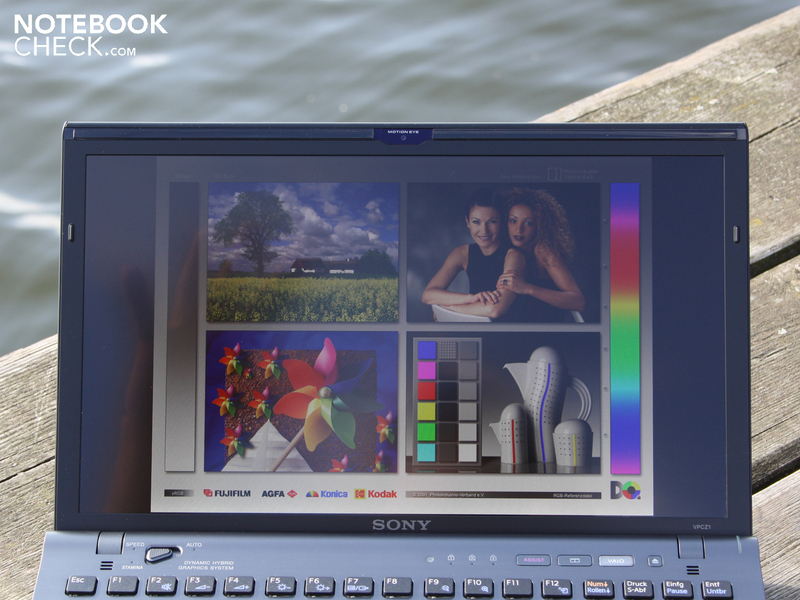 Sony Vaio VPC-Z12M9E/B: Exceptionally high with packed into 13.1 inches. 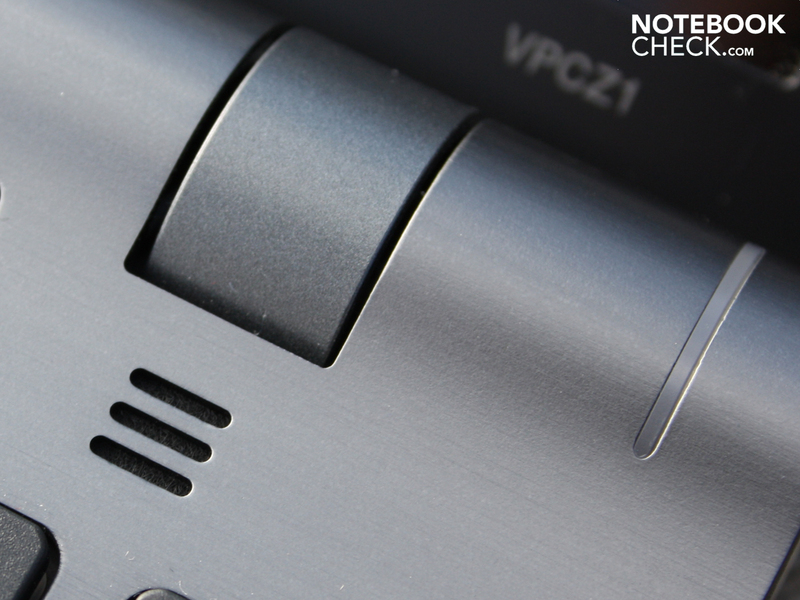 Based on experiences from our previous tests, small and handy business subnotebooks that have serious performance usually come in the form of the Lenovo (z. 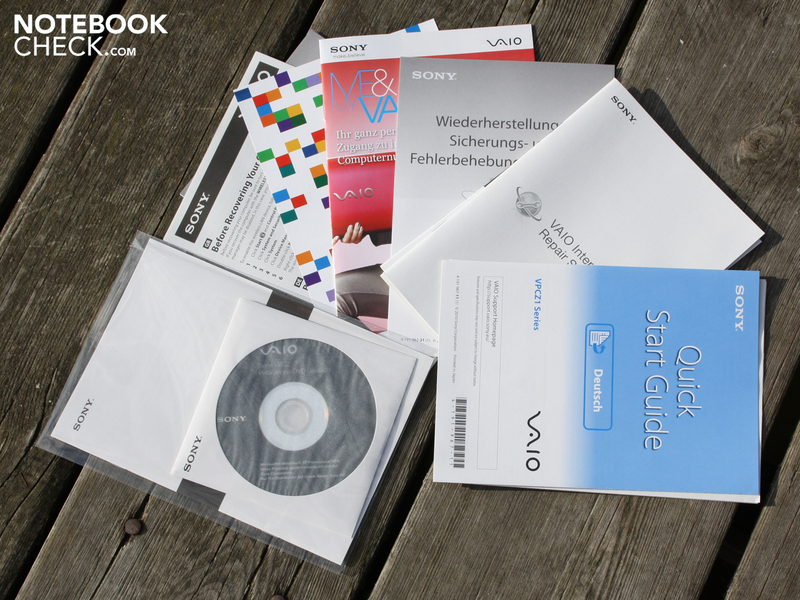 B. Thinkpad X201), HP (EliteBook 2540p), Sony (Vaio VPC-Z11X9E/B) oder auch Acer (Travelmate 8172T-33U4G32N). In between times, the Asus has also earned some respect with its PL30JT-RO030X. 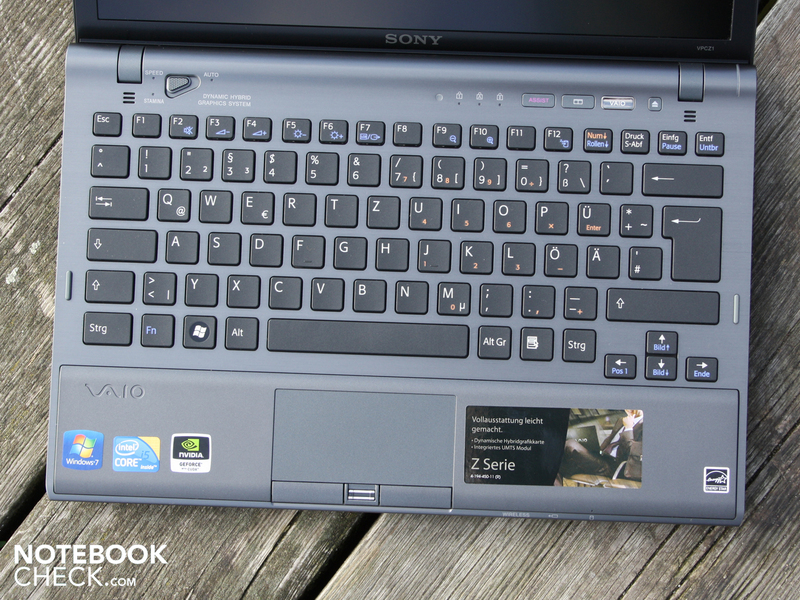 The predecessor to this model is included in our top 10 list which contains some of the best subnotebooks around: The Vaio VPC-Z11X9E/B arrived on the German market in April 2010 and managed to earn itself a "very good" rating (89%). The reasons for this were the excellent display, very good performance, a very good keyboard and a high level of finish. At first glance, the VPC-Z12M9E/B does not really differentiate itself from its Z11X9E/B predecessor. This is neither from a technological, nor from an esthetic point of view. After a detailed study of the configuration and technical specifications given on the manufacturer’s website, we could only find only two differences: Firstly, instead of two Samsung SSDs (MMCRE28GQDXP-MVB), the Z12M9E/B now has two Toshiba SSDs (THNS064GG2BNAA). The capacity of the RAID 0 system remains the same: 2 x 64 . Secondly: There is a fingerprint reader. 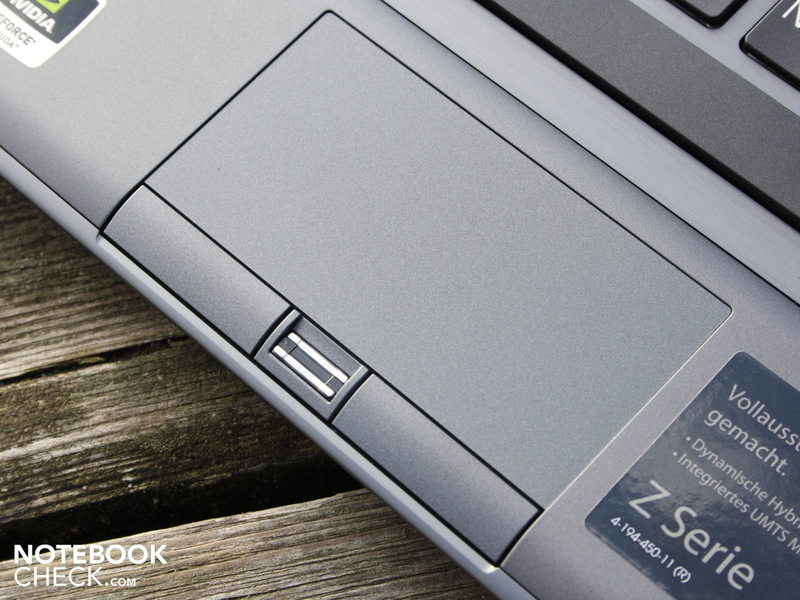 In our test, we want to find out whether the performance specifications have changed as a result of the Toshiba SSDs. Has the Geforce GT 330M remained underclocked? Did Sony keep the high contrasting display of the Z11X9E/B? You will find the answers to these questions in this in-depth review. 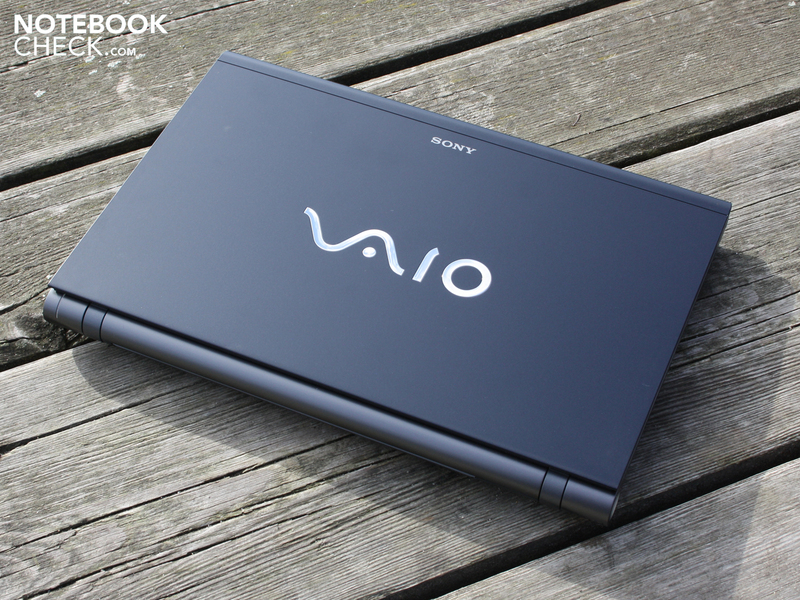 The Sony Vaio Z12M9E, with ist 13.1" display and inbuilt optical drive, weighs in at a mere 1.406 grams. 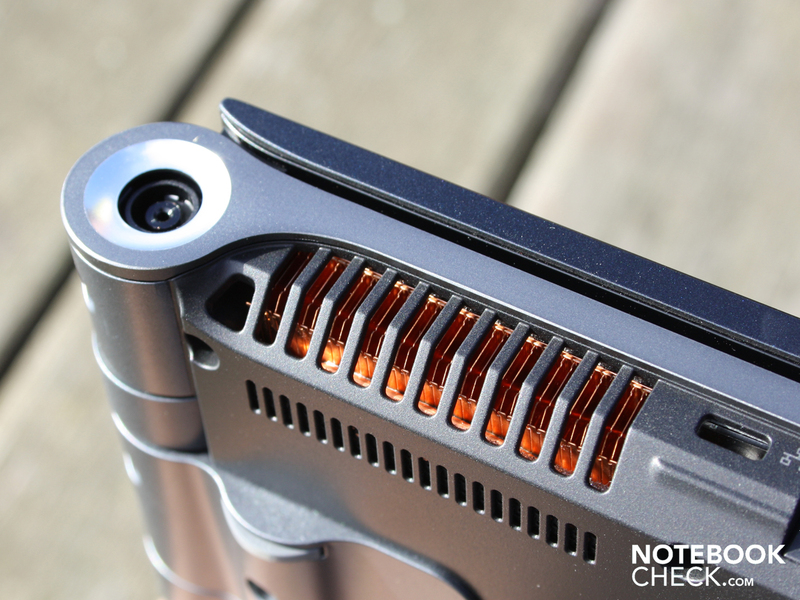 The housing is made out of carbon fiber with the palm rest constructed from aluminum. It is optimized for mobility and very warp resistant. No matter how hard we tried to bend the chassis using two hands and normal levels of force, our success was only marginal. The material is stiff and light, with its hard, metallic appearance giving off a first class impression. The aluminum palm rest impresses with a high level of rigidity and refuses to be dented. The same goes for the touch pad. The same cannot be said for the bottom panel which can be warped quite considerably underneath the optical drive. The lid is sufficiently rigid considering its flat construction. It can be warped by several degrees when grabbed from the opposing corners. The two display hinges are taut. The screen remains firmly in its chosen position and does not allow any residual movement. It can be opened with one hand without the base unit being pulled up at the same time. The work surface is ideally suited for business/work purposes. The manufacturer chose not to go with a shiny surface for this particular model and ones hands rest comfortably on the raised and constantly cool palm rest (22 to 25 C° depending on the load). The raised position encourages an ergonomic position which most users should find quite comfortable. 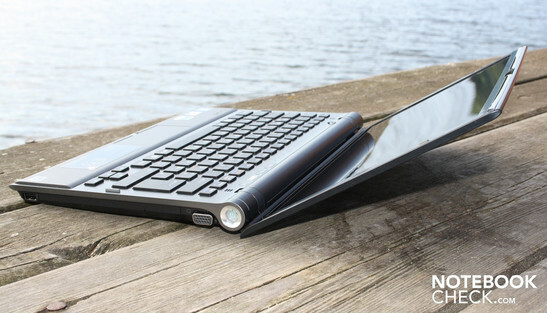 A mere 1.4 Kilograms, high quality carbon fiber and Aluminum surfaces with no glossy finish and taut hinges. All the connections can be found on the right, left and front side of the housing. There are no connections at the rear due to the lid’s low mounting position. 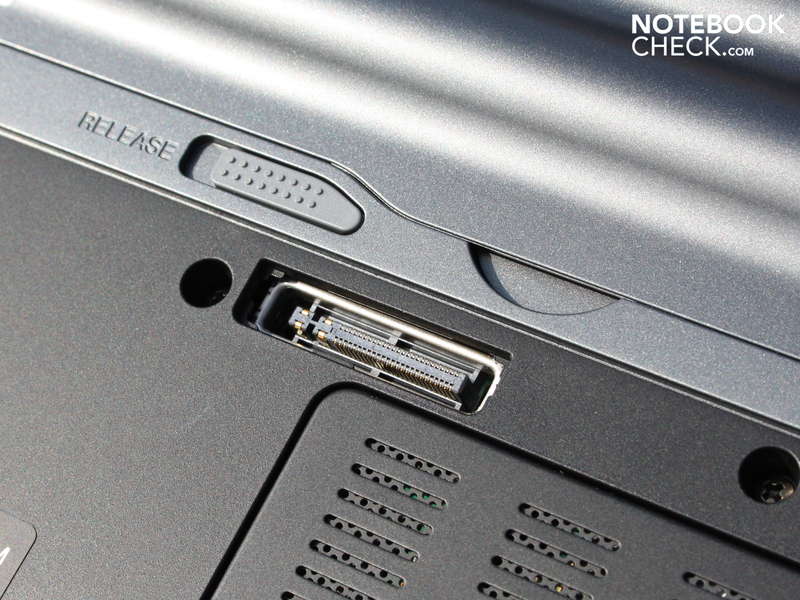 The VGA connector is located on the right hand side next to the DVD player. 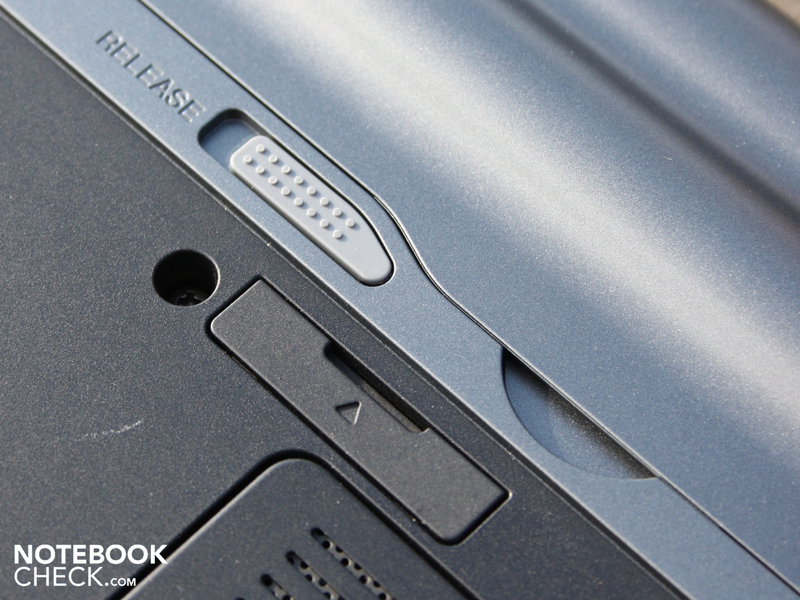 Thanks to Sony’s precise positioning, even a large VGA adapter will not foul the opening of the CD tray. 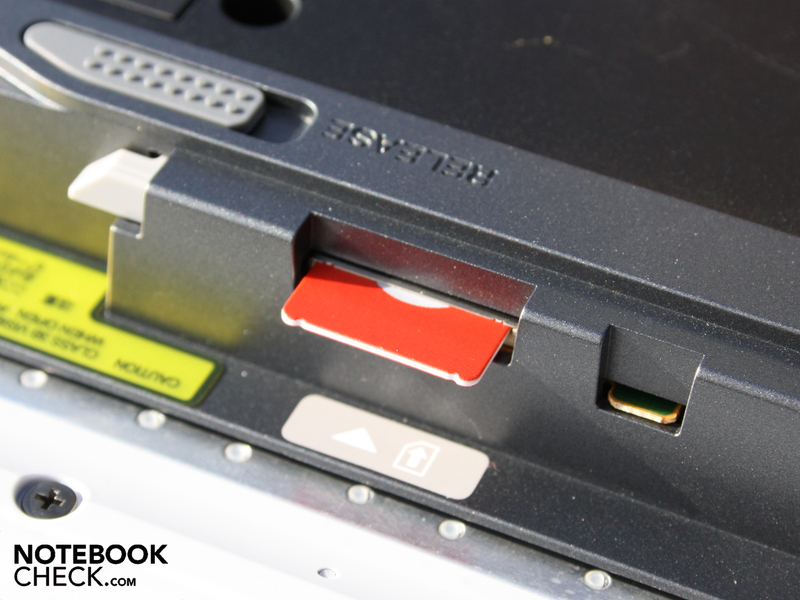 You will not find a FireWire (i.LINK) port here, but one can install one using the ExpressCard34. The same goes for USB 3.0. 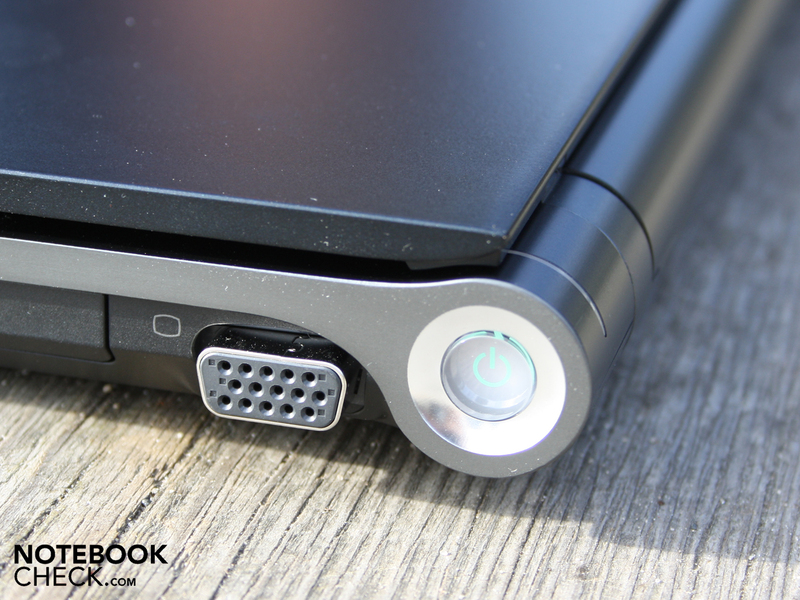 A peculiarity of the Sony laptops is the presence of two card readers (SD, HG Duo). The wired Ethernet connection can transfer data on a Gigabit level. The WLAN also features the fastest available standard (Advanced-N 6200). Just like its predecessor (the Z11) one also decided to install a 3G module (Qualcomm Gobi 2000 HSDPA). 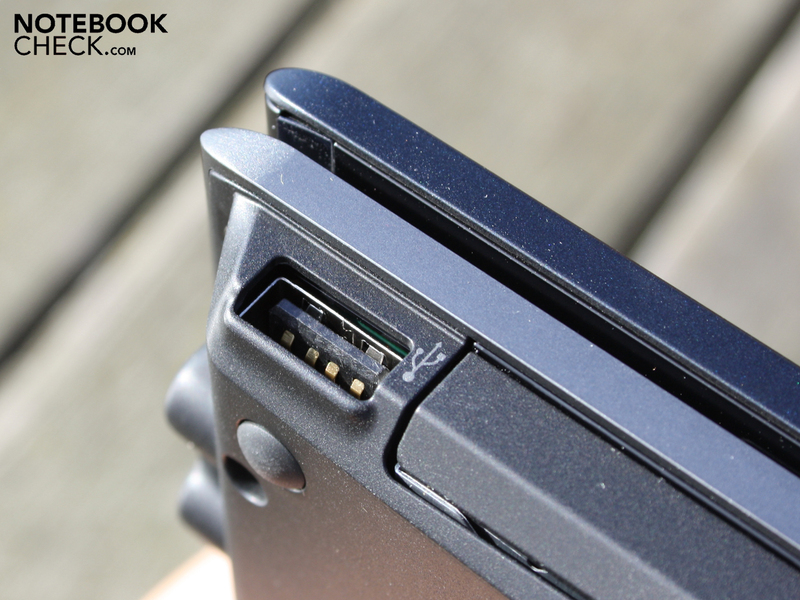 Sony offers a special docking solution for the Z12/Z11 models. 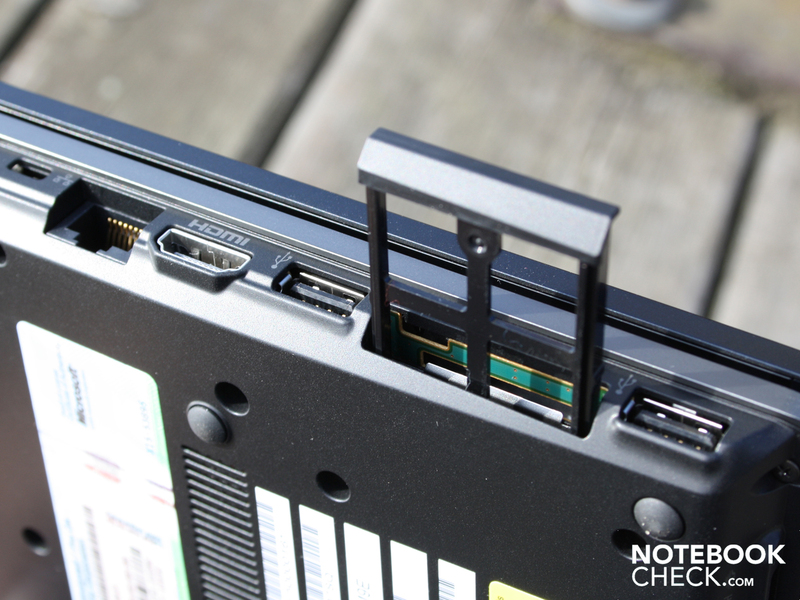 The Vaio VGP-PRZ10 docks itself to the underside oft he 13.3" laptop and duplicates the following connections: USB, 1x GB LAN (RJ-45), 1x 15-Pin D-Sub VGA, 1x DVI-D. The DVI-Port is therefore the only additional interface that is provided. This docking solution will set you back 175 Euros. An interesting feature, is the 3 way button to switch between the Intel GMA HD (in i5-520M) and the dedicated Nvidia GeForce GT 330M. Which one of these is active, is indicated with a discreet LED light (includes automation). 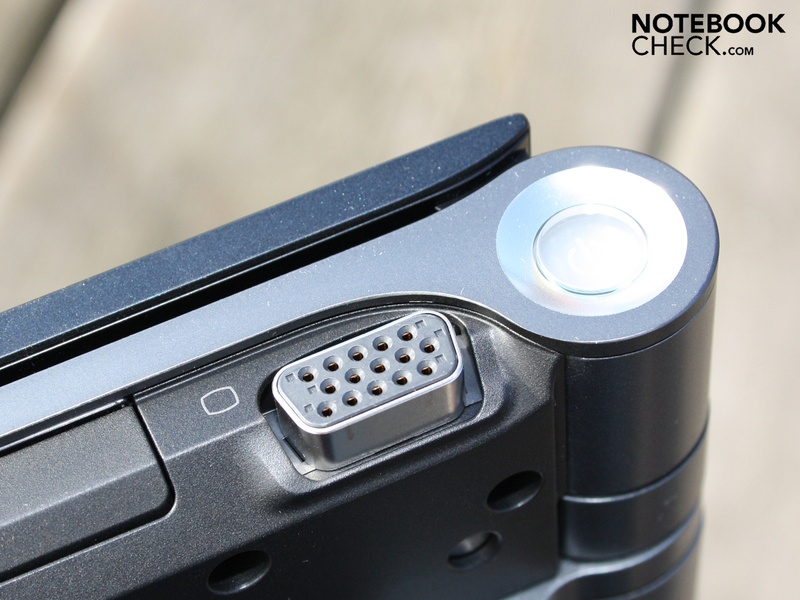 Sony does not favor the use of the Sony Nvidia Optimus, and has chosen for a Multiplexer (for 13.1” TFT and VGA, HDMI only works with active GT330M), as seen with many former hybrid-graphics-solutions. 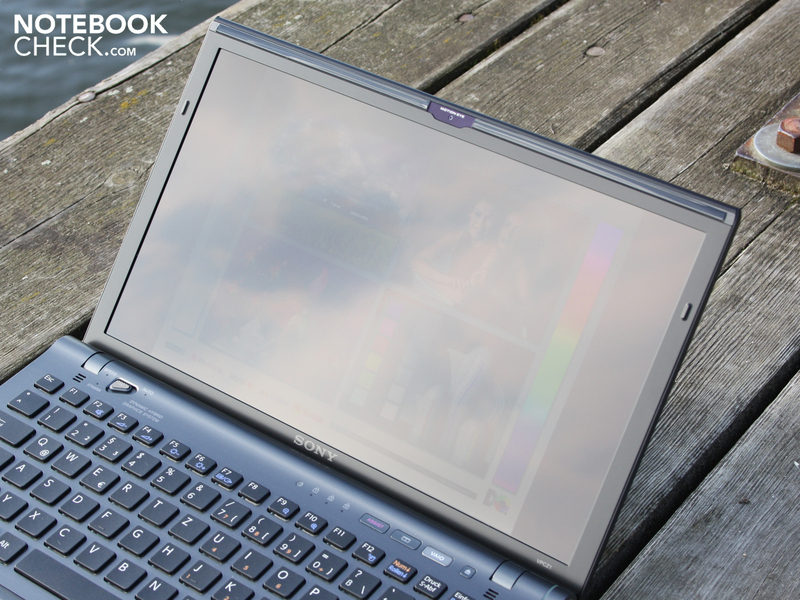 The result is, that this Subnotebook suffers from the known drawbacks of "Switchable Graphics", which would be the flickering screen when switching modes (lasts a few seconds), and the necessity to end applications which use the graphics card (this includes Google Chrome!). The free standing buttons are a great distance from each other and are also a good size (14x14mm). The pressure point and key stroke are very noticeable. The keysstroke prominent, but not hard. The input surface does not give way and is definitely ideal for heavy use. 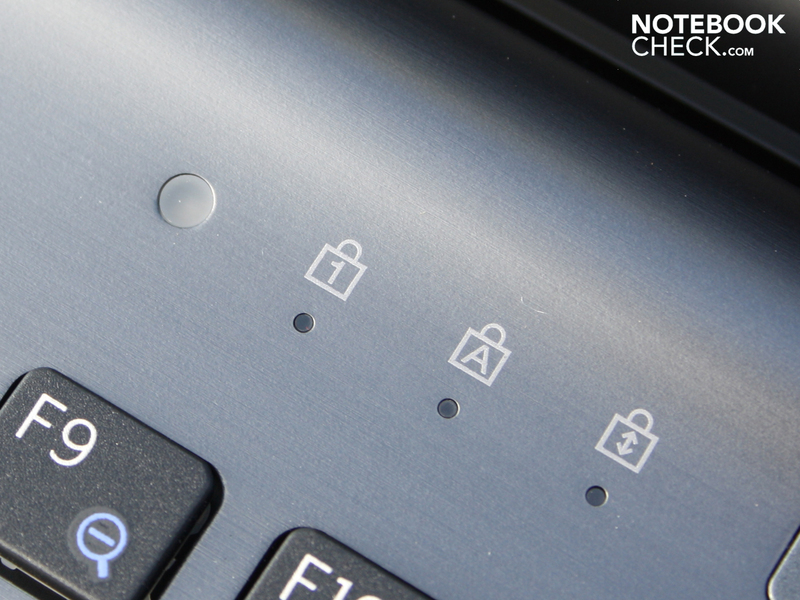 The keys have a grippy feel to them and appear to have a thin rubber coating. 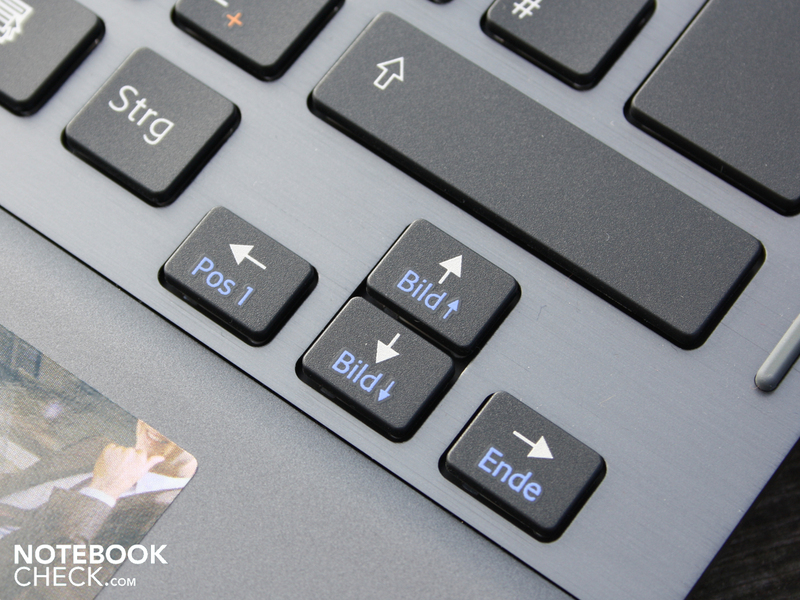 Very positive: The clearly displaced arrow keys and the extremely large Enter and Shift keys make a good impression. The keys are easily found without looking and typos are a rarity. Sony decided not to include a number pad in favor of key size. Those who wish to use a number pad can do so by pressing the Fn+Num keys and using the highlighted numbers on the letter keys. While moving over the large, mat surface area, one notices that the Synaptics touchpad is very precise. 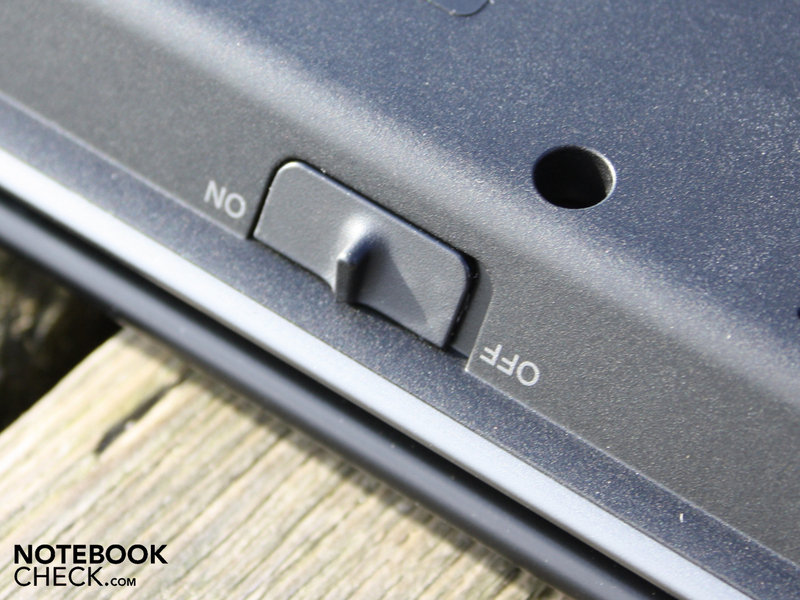 Unlike many of its counterparts, this touchpad solution is accurate right up to the outer edges. The pad cannot be switched off using the Fn key, however the Multi-Touch Pad (Synaptics V7.4), does recognize the use of two fingers (zooming, scrolling, browsing). 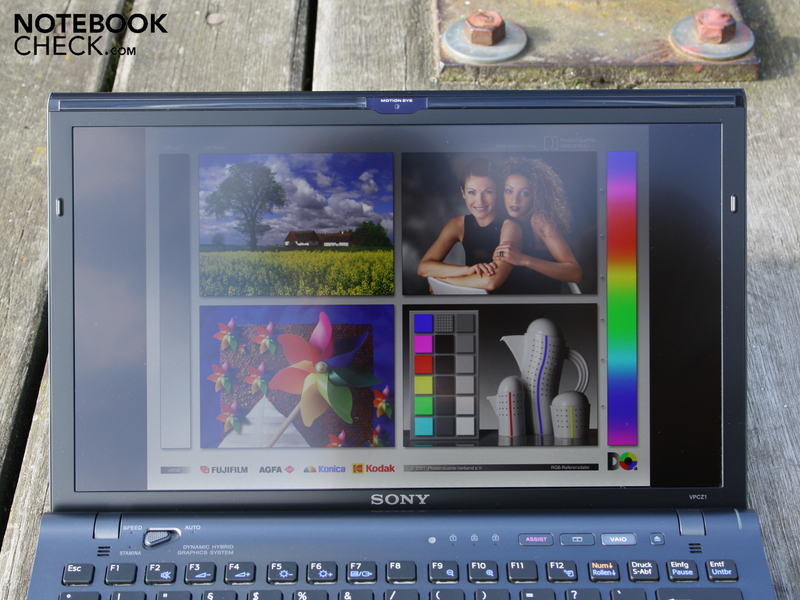 The 13.1“ WXGA++, non reflective display which is provided with the Vaio Z12M9E, impresses with its 1.600 x 900 pixel resolution (16:9). 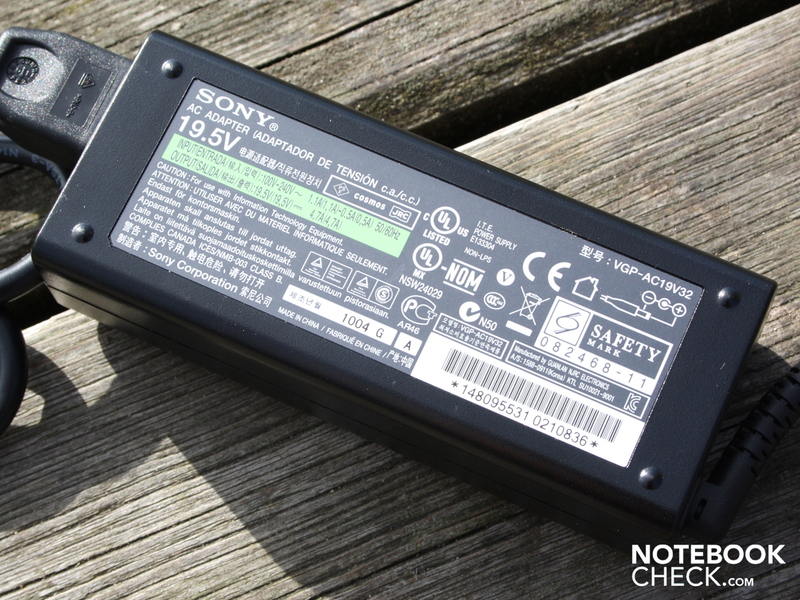 The Sony panel (SNY06FA) has an anti-reflective coating. 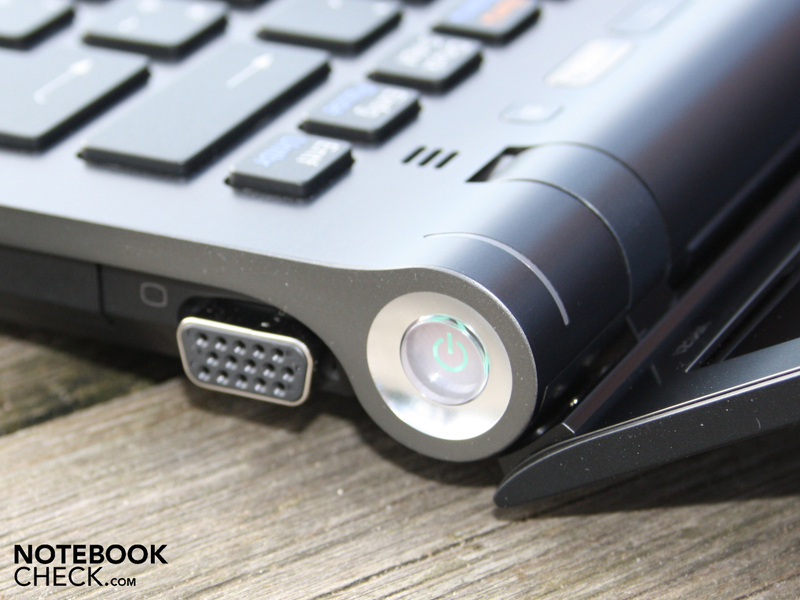 Even on such a small laptop, the high resolution makes working a comfortable and organized experience. Generally, large Excel documents, website back-ends and company applications will have no problems fitting into this level of resolution. 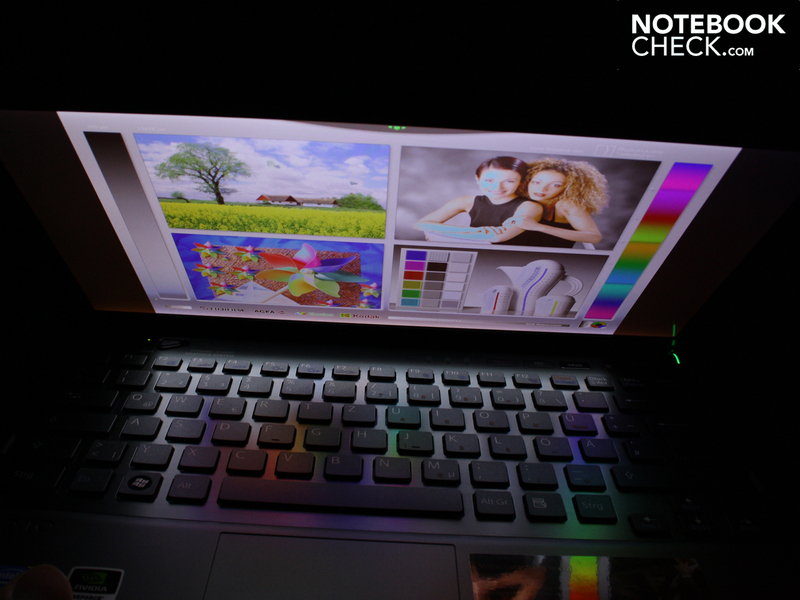 The resolution is pleasing, but the highlights are the contrast, illumination and viewing angles. All of the following measurements are identical too the Vaio-VPCZ11X9E/B, which has exactly the same type of panel (SNY06FA). We would recommend that you read our review of the VPCZ11X9E/B to see the measurements concerning the visible color spectrum. Our subjective impression of crisp colors was confirmed with a measured contrast of 773:1. Together with an evenly distributed illumination of 91 percent as well as a wide viewing angle, makes working with this display an enjoyable experience. The brightness of the LED lit screen can be adjusted automatically with the ambient light sensor. The sensor adjusts the lighting of the screen according to the brightness in the room. The sensors turn the illumination to full under direct sunlight. 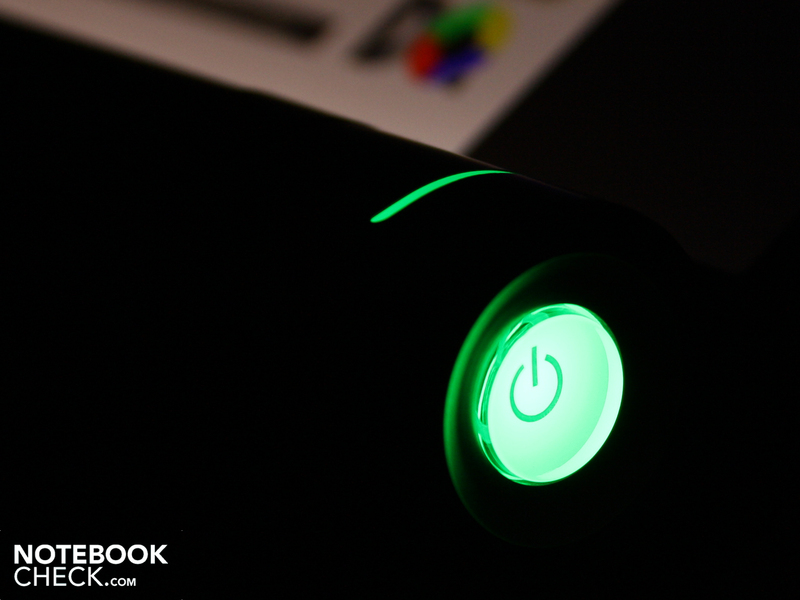 During our measurements, we turned the ambient light sensor off (in the Vaio Control center). We measured an average value of 303 cd/m². The brightest point reached an impressive 314 cd/m². 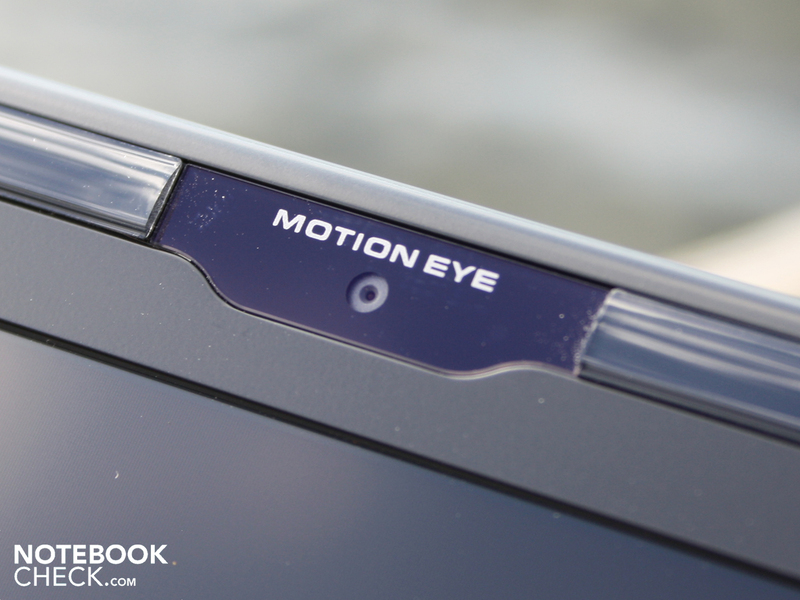 The purpose of the sensor is to save energy and to reduce eye strain. Implementing a power saving feature at this point is sensible as the LED lighting requires 3 to 5 Watts of power. In addition, a TFT screen which is too bright in relation to its surroundings can cause eye strain. We found there was no need for additional, manual adjustments. The anti reflective property of the panel is the most important prerequisite for relaxing work experience under daylight conditions. The reflections are barely visible. The following pictures show the display panel when subjected to daylight. Whether looking head on, or from the side, the illumination is more than enough to provide a clear image. The horizontal viewing angles have the greatest tolerance. 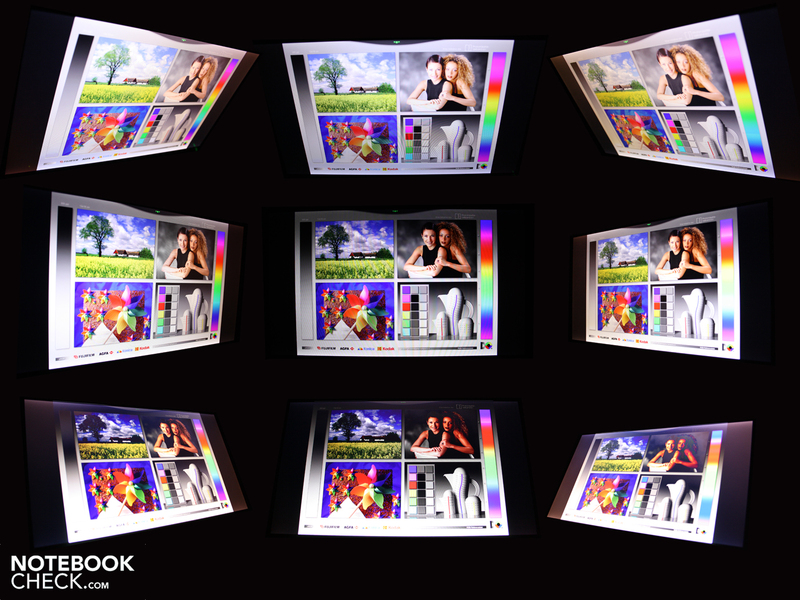 The colors do not distort, the TFT simply appears less bright. When viewing from the top or bottom at more than a 15 degree angle, one notices an increasing level of color inversion. This is a typical property of almost all TN displays. 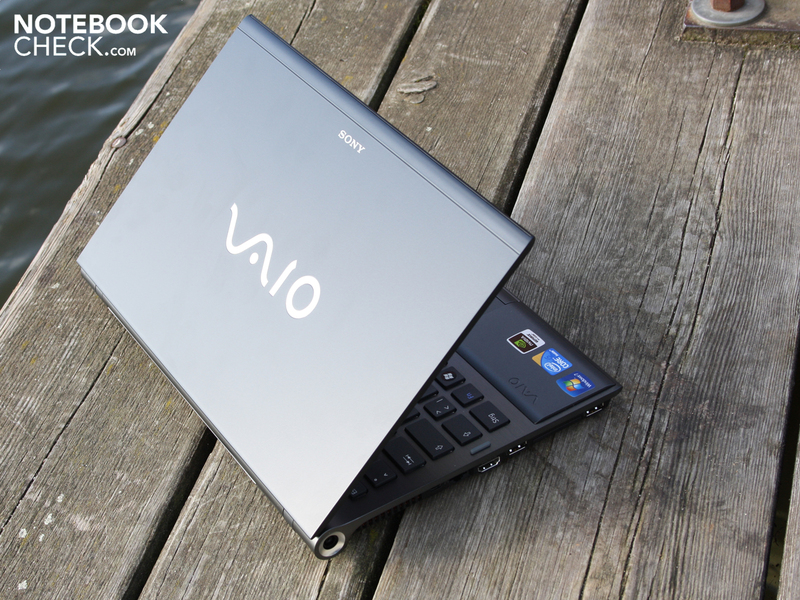 Sony has provided the Vaio Z12M9E with a Core i5-520M (clock speed 2.4 GHz). The actual clock speed of this dual core CPU, while using Turbo Boost, lies between 2.40 and 2.93 GHz. This processor driven overclocking affects each of the four cores individually (native and virtual threads). Hyper-Threading compliments the two physical cores with two virtual ones providing applications with up to 4 cores. 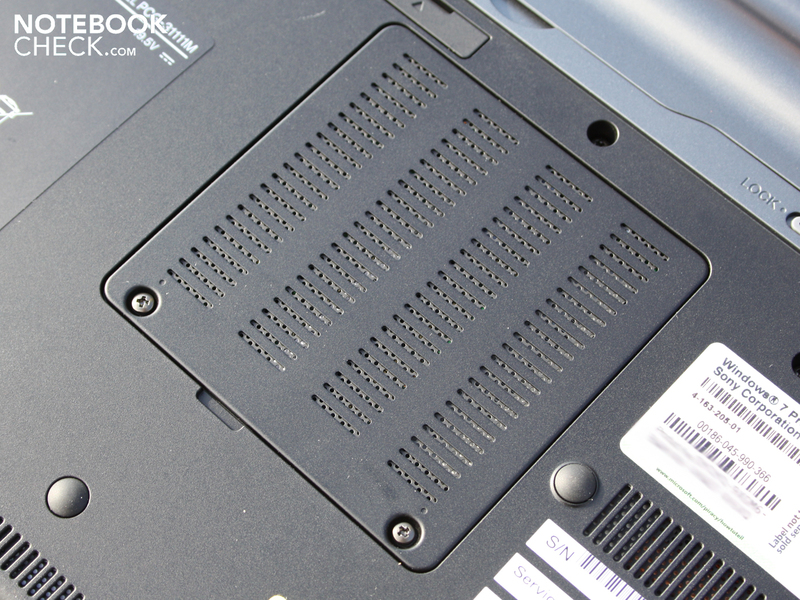 The four gigabytes of DDR3 RAM (PC3-8500F) can be found in two slots behind a panel under the laptop. The speed which one actually perceives, is the joint effort of the CPU, graphics card, RAM and the hard drive. We checked the application performance using the PCMark Vantage. The end result of 10.245 points is truly remarkable, as it is the 5th best result of any of our tested units. Its predecessor, the VPCZ11X9E/B had 9.491 points. 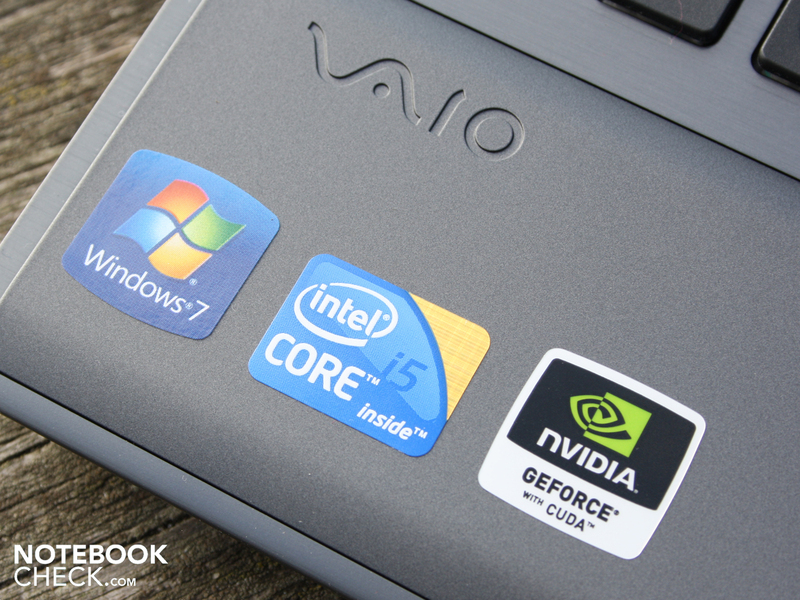 This results puts the Vaio-Subnotebook just behind the gaming machines Alienware M17x (2 x HD 4870, i7-620M) and mySN XMG8.c (GTX 285M SLI, i7-620M). 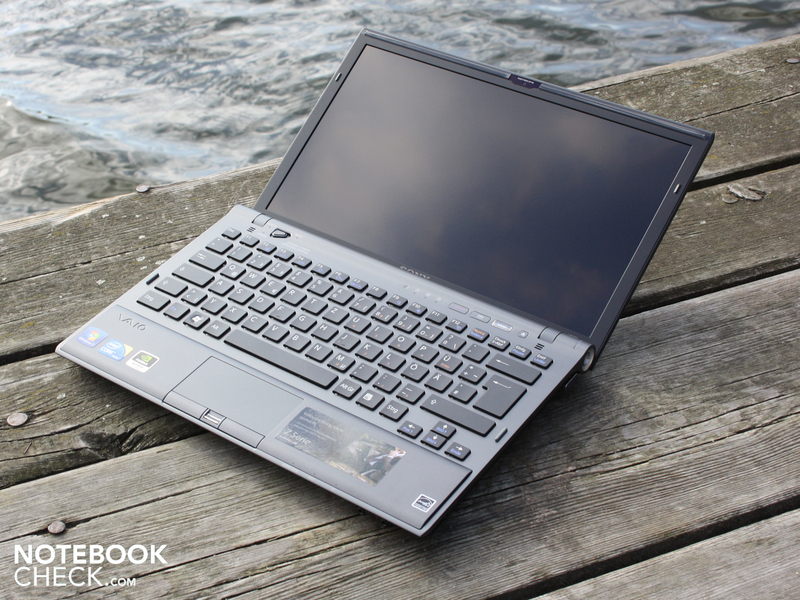 Other recently tested businnes laptops therefore now find themselves at the bottom of te PCMark ranking list: Fujitsu Lifebook S760 (620M, Intel HD: 6.178); Lenovo ThinkPad W510 (820QM, FX880M: 5.857); Fujitsu Lifebook T900 (520M, Intel HD: 5.591). We start by asking ourselves the question wether the RAID 0 system with 2 x 64GB SSDs (Toshiba THNS064GG2BNAA), delivers a differnt performance compared to the 2 x 64GB Samsung SSDs that were in the VPCZ11X9E/B. The performance data measured by CrystalDiskMark 3.0 speak in favour of the Toshiba RAID 0 system found in our test unit. The Toshiba RAID 0 combination performs slightly better as it can write large chunks of data at a faster rate (seq.). On the other hand, it has difficulty writing scattered 4K data packages. Reading packages of that size however, is something that the Toshiba does at a significantly faster rate. These figures explain why our test unit managed to achieve a dizzying HDD score (PCMark Vantage), of 24.467 points. That is currently the 2nd highest HDD-Score we have ever measured (after mySN MG7.c with Intel X25-M G2 SSD, 80 GB). The predecessor with its Samsung SSDs achieved a score of 17.406 points, which underlines the fact, that the Toshiba solution is better in the real world. 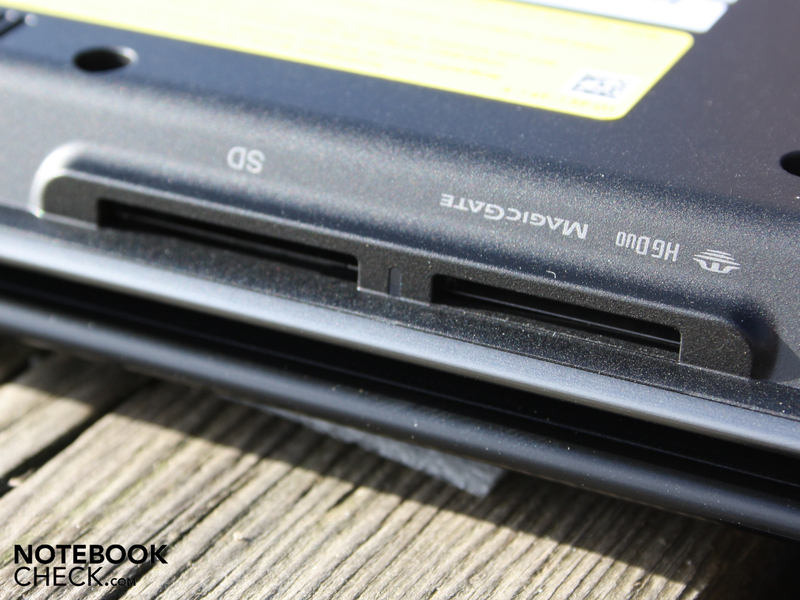 Typical laptops with mechanical, 5200 rpm HDDs typically receive an HDD score between 3.000 and 3.500 points. An Nvidia GeForce GT 330M with 1.024 MB DDR3 RAM ist he GPU of choice. Its core and memory are clocked at 475 MHz and 700 MHz respectively. Sony underclocks this GPU quite considerably. A more typical value would be 575 / 790 MHz. Because of this, the GT 330M, which usually sits in the middle of Nvidia’s line up, can only reach the performance level of a GT 325M. This is on par with the results of our gaming test. The graphics benchmarking tool 3DMark2006 gives it a score of 5.569 points. Under normal circumstances, the GT 330M should be able to achieve more than 6,000 points effortlessly. This results puts our test system well under the performance level of a Mobility Radeon HD 5650, which can achieve 6,000 to 7,000 points depending on the CPU which accompanies it. Bad Company 2 requires powerful hardware. Even a standard GT 330M does not play this game smoothly at high detail. When set to a high level of detail we only measured 17 fps (1.366x768). We had the HBAO activated to improve the illumination. Gaming was not perfect with an intermediate level of detail either, yielding 26 fps. To put this into comparison, an ATI HD 5650 with the same CPU will achieve 44 fps under the same conditions. (Acer TravelMate 5740G-524G50MN). In this game we only managed to enjoy the shoot outs when the level of detail was set to intermediate, resulting in 32 fps. A GT 330M with 575 MHz would achieve 38 fps. A middle of the road GPU such as the HD 5650 (Acer TravelMate 7740G-434G50Mnss, 44 fps) would do even better than that. Although the underclocked GT 330M might limit the game play and the frame rates, it still provides a truly impressive gaming performance for a subnotebook. Current games can also run at low or intermediate levels of detail while casual gamers will find plenty of older, or less demanding games which can be enjoyed at their highest settings. Surfing the internet, writing e-mails or creating Excel tables isn’t taxing for the CPU and can be performed while the fan is running at its lowest setting (30.6 dB(A)). This includes Speed-Mode with active GT 330M. When subjected to the heavy loads required by Power-Users, the noise levels vary between 38 and 41.3 dB(A). This level of noise can no longer be ignored, but it is still quite acceptable. We managed to generate these noise levels when demanding a constant level of performance from all 4 cores (Prime95), or when using 3DMark2006. A stress test using Furmark and Prime95 makes all 4 of the threads in the i5-520M run at 100 percent, as well as the shaders of the GPU. This brought the fan up to its highest level reaching a maximum of 52.1 dB(A). At idle, the noise levels are just as low as the temperatures found on the housing. The average surface temperature is around 24 degrees Celsius and the base plate is equally impressive with an average 25 degrees. When put under maximum load for several hours the temperatures increase noticeably, but never reach a critical level. At this point in time we measured 43 degrees Celsius in the immediate vicinity of fans exhaust port. These are still impressively low figures for a small Subnotebook with a powerful Core i5-CPU and dedicated GPU. The CPUs temperature sensors reached a maximum of 97 degrees (stress test). It only reaches 40 degrees when used for light office work. The GPU did not exceed 87 degrees. Despite the high values, the computer never crashed or required a forced restart during a stress test which lasted several hours. (+) The average temperature for the upper side under maximal load is 28 °C / 82 F, compared to the average of 30.7 °C / 87 F for the devices in the class Subnotebook. (+) The maximum temperature on the upper side is 34.6 °C / 94 F, compared to the average of 35.8 °C / 96 F, ranging from 22 to 57 °C for the class Subnotebook. (+) In idle usage, the average temperature for the upper side is 23.8 °C / 75 F, compared to the device average of 30.7 °C / 87 F.
(+) The average temperature of the palmrest area of similar devices was 28.6 °C / 83.5 F (+3.4 °C / 6.1 F). 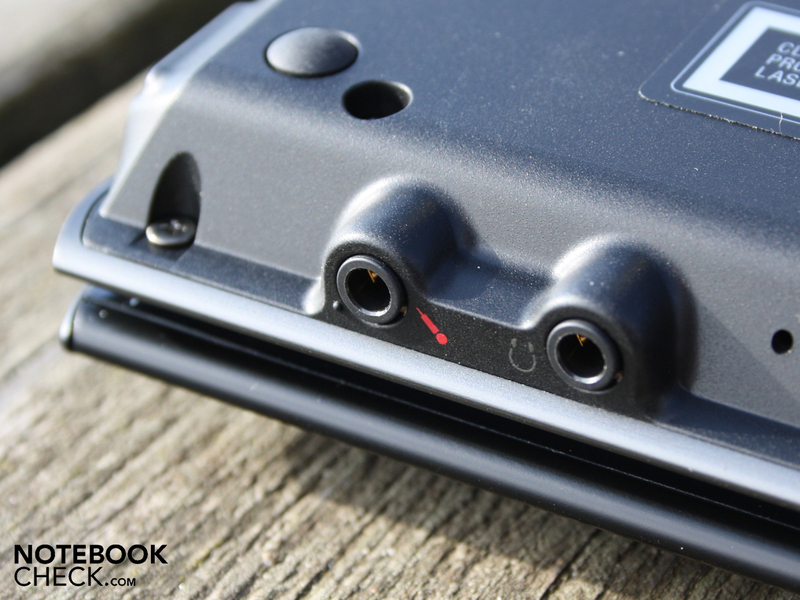 The mini, stereo speakers, which are positioned above the keyboard, deliver a very high pitched sound. The volume isn’t particularly high either, but on a positive note, that prevents any distortion at the hightest level. We connected a pair of Yamaha speakers (YST-M20SDP) to the front mounted audio-out jack, which produced very good sound without any background noise. 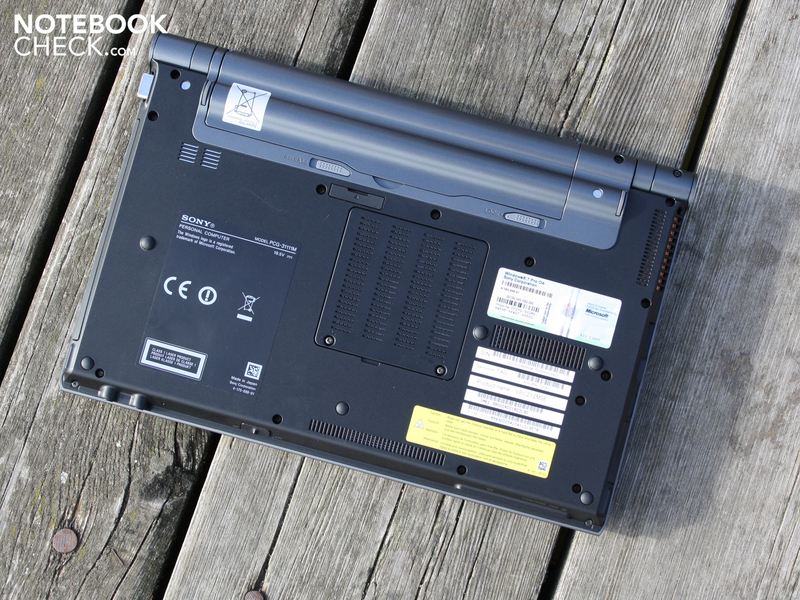 This 13.1" subnotebook is supplied with a 58 Watt battery. (5.400 mAh). 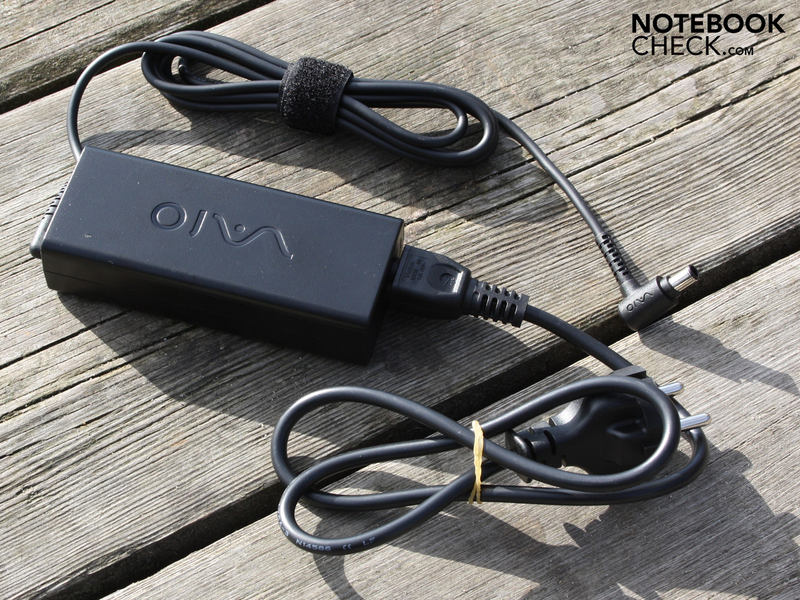 This is enough to keep the Vaio going for three hours (191 minutes) when surfing the Web using WLAN. This time was taken while using the Stamina Mode (Intel HD) with the brightness set to approximately 100 cd/m². 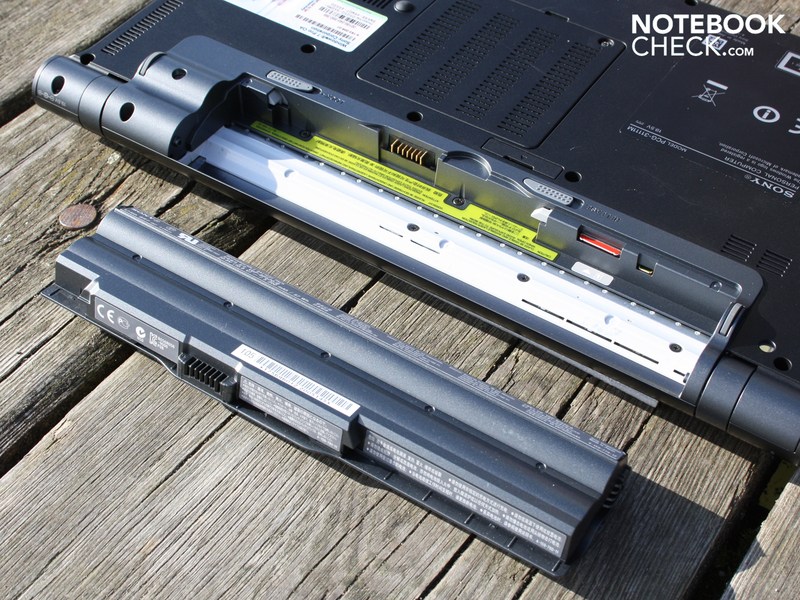 The battery life is increased substantially when performing office tasks with the brightness reduced. This was the result of our Reader-Test which ran for 366 minutes (reading text with brightness set to minimum; 6 hours). Its predecessor, the VPC-Z11X9E/B (520M, GT 330M), also managed 3 hours (190 minutes) in the WLAN test. For those who prefer to surf using the inbuilt Qualcomm 3G module with HSPA or UMTS, can also expect to have three hours. Our test using the D1 network ended after 178 minutes. DVDs can be enjoyed for about three and a half hours (223 minutes), which is enough for 2 movies. Once the battery is drained, you will need to wait 3:12 hours (193 minutes), for the battery to be reach a full charge. The impression that was achieved from the battery life test was confirmed by the measurements we obtained concerning the power consumption. The Z12M9E is very frugal. The (lowest), consumption at idle was 7.5 Watt (Stamina mode bzw. Auto; Intel HD). The maximum consumption at idle was 15.2 Watt. During which all power consuming components were active (wireless, max. screen brightness and performance). It’s a different story when under load and with the Geforce GT 330M switched on. Now in Speed Mode, running 3DMark2006 demands 53.5 Watt and climbed to 76.2 Watt during our stress test. The small 90 Watt power supply (291 grams), is well suited and reaches a maximum of 53 degrees Celsius while under heavy load. From a technical and esthetic point of view, there are no dramatic changes between the VPC-Z12M9E/B we tested, and its VPCZ11X9E/B predecessor. This, as far as we're concerned, is good news. The performance figures are very similar, but we did manage to measure an improvement resulting from the Toshiba RAID 0 SSD setup (Z12M9E/B). We believe the new model number was motivated by product policy and was not really necessary. This product policy does have a monetary benefit for its customers however. The Z12M9E/B is available from 1779 Euro where as one had to invest 1870 Euro for its predecessor. These prices seem to be dynamic however and are slowly closing in on each other. 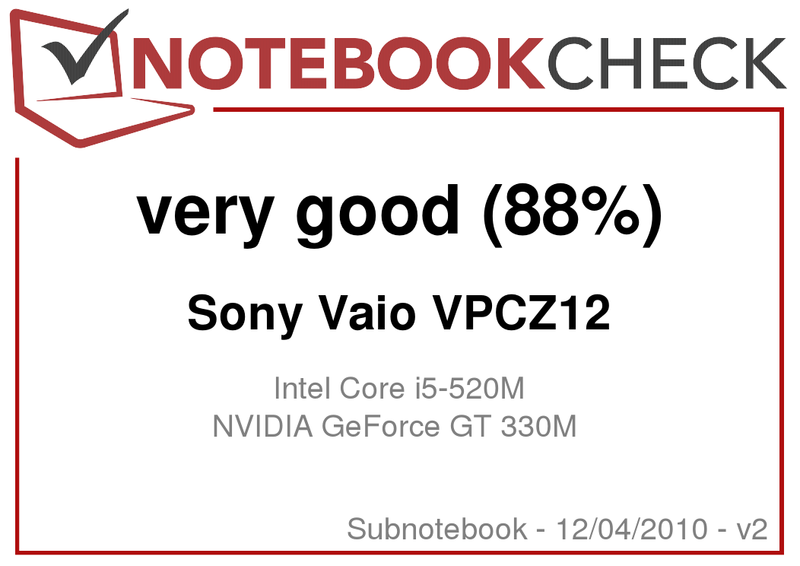 The Vaio Z12M9E/B has definitely deserved its „very good“ rating. It packs a serious punch with its powerful Core i5-520M (2 x 2.4 GHz, Turbo Boost, Hyper Threading), and the Geforce GT 330M (underclocked). 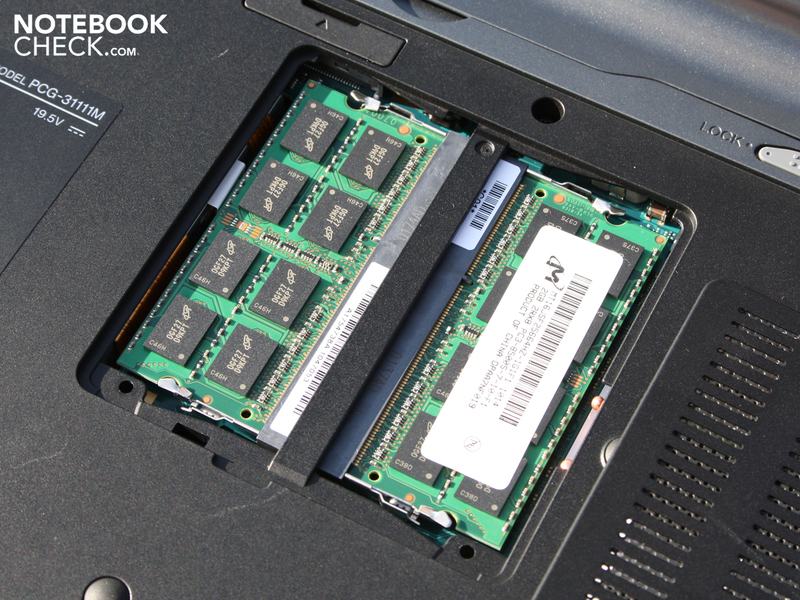 It is however, the Raid 0 setup with two 64 GB Toshiba SSDs, that turn this 13.1” subenotebook into a real power house. The Z12M9E/B places itself among the elite in the benchmark rankings of the PCMark Vantage and PCMark05. For business users, the plus points are the docking station, the high quality input devices, the in-built in 4G-Modul, matt display and excellent level of finish. The battery life of 3 hours (WLAN web surfing), is appropriate but not particularly great. The noise levels are audible but acceptable. It is only under load that it may become irritating. 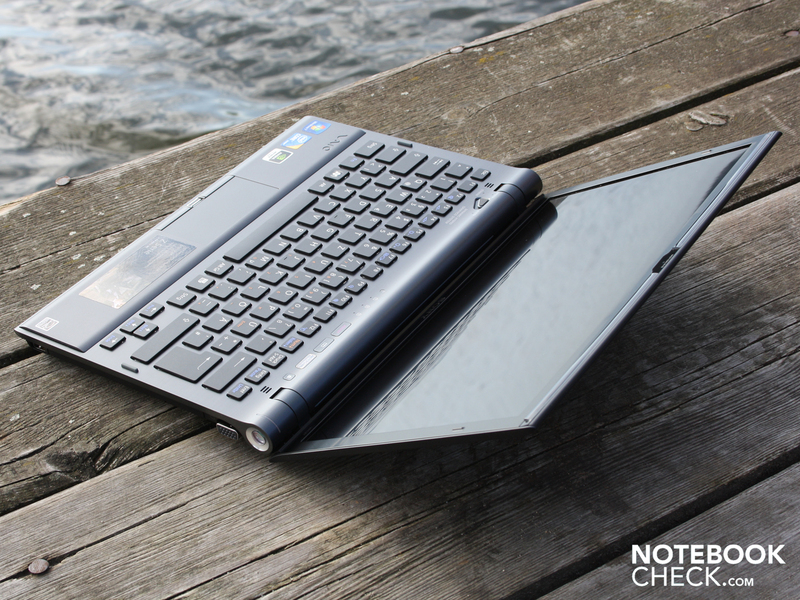 For those who think the Vaio Z12 would be perfect, but find the 1,800 Euro price tag discouraging, we would recommend the Acer Travelmate 8472TG. This 14” business machine, with matt display and i3-Prozessor, will set you back 850 Euro. The editors liked the performance, battery life and the docking station. The Geforce GT330M is not underclocked either. For those who want an even longer battery life and can live without the SSDs, we would recommend the Asus PL30JT-RO030X as an interesting alternative for 900 Euro. 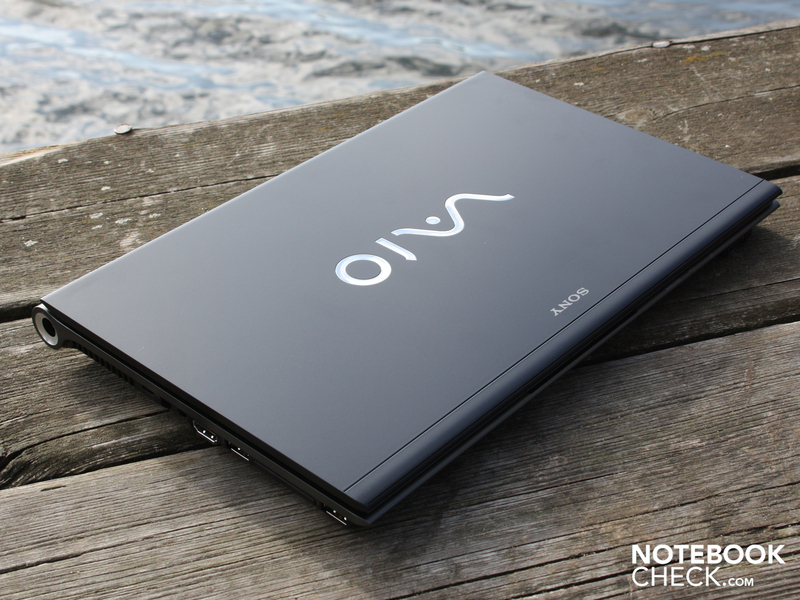 Vaio VPC-Z12M9E/B: Top performance in the 13-inch category and acceptable battery life of three hours. and two card readers: SD and HG-Duo. 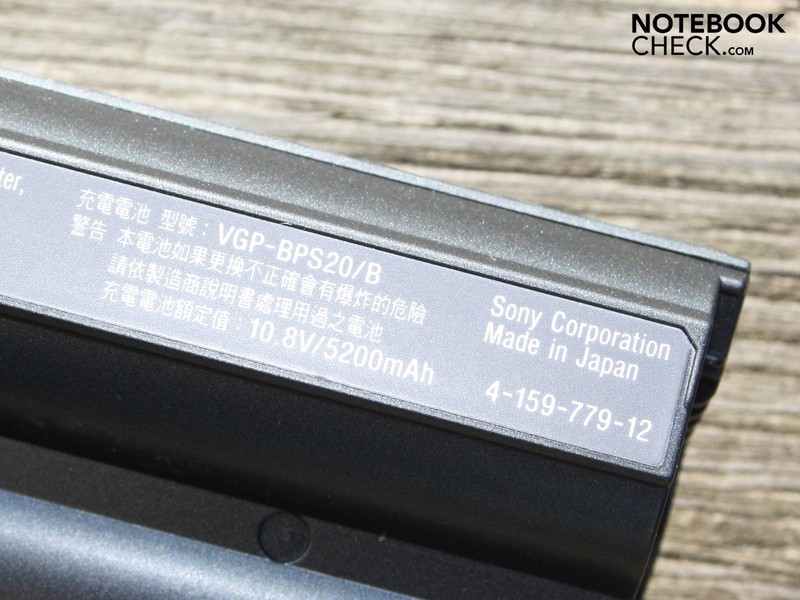 Sony supplies a 5.200 mAh battery. Therewith we can surf in the internet via HSDPA-module for more than three hours. 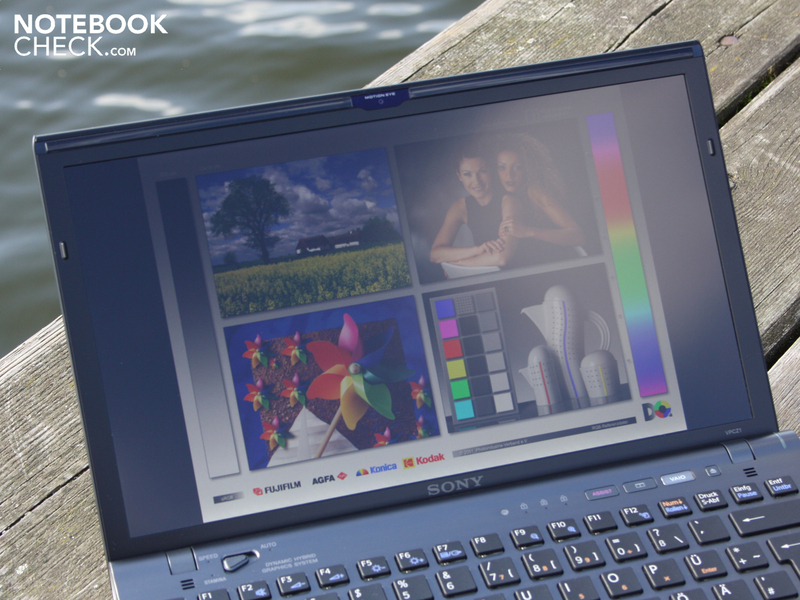 Thanks to the matte, bright display, this is also possible outdoors. But, you should not forget to take the power adapter with you. It only weighs 291 gramme. Where are recovery media? The user has to burn such himself. and thin and slim case. No ULV, but standard notebook hardware: i5-520M and Geforce GT 330M. Switch between Intel HD and GT 330M (no Optimus). The power switch gleams and dims in stand-by. 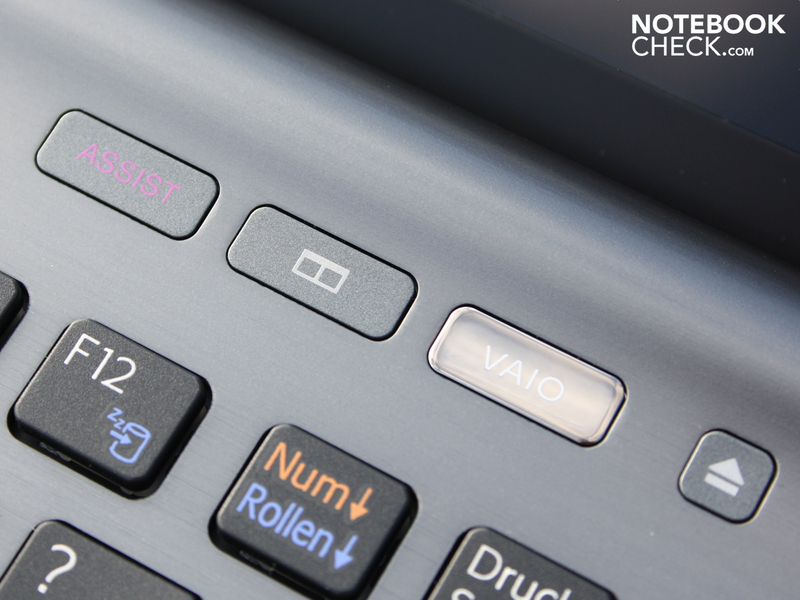 It looks neat with only few hotkeys: Assist, software launch and Vaio-tools. An ambient light sensor controls the brightness of the display. The hinges successfully support the thin lid. + Extremely fast "hard drive"
A longer battery life would be great, but, it is indeed sufficient. The RAID 0 SSDs change our view in terms of good system performance. Flash clearly outperforms its rotating colleagues.